The Kindle may beat Nook slightly in a few areas, but when it comes down to it, nobody getting a Nook is going to walk away disappointed because it's not a Kindle. 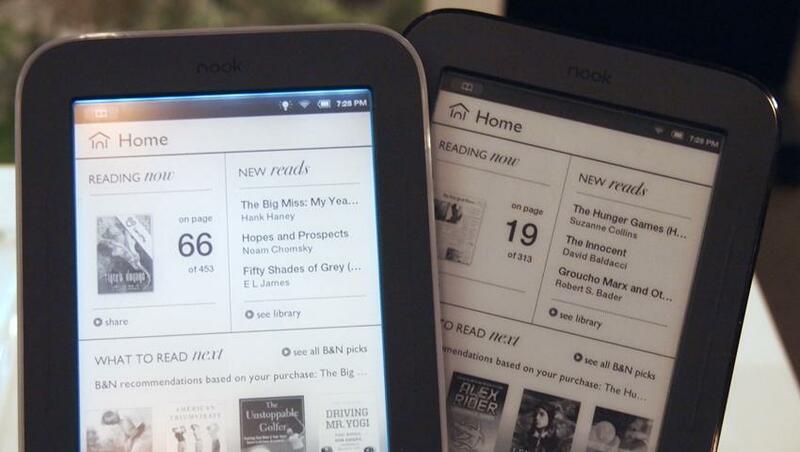 And in many ways, the Nook is superior to Amazon's market leader. Dedicated e-readers like the Nook and Kindle deliver sharper text, longer battery life, and better outdoor readability than multifunction tablets, but they also come with one inconvenient caveat for bookworms: No backlighting. Unlike a backlit LCD, E-Ink screens rely on ambient light, so when the lights go out at night, so does your opportunity to read. A number of third-party lights have emerged to overcome this limitation, but Barnes & Noble decided to fix the problem at the source with its new Nook Simple Touch with GlowLight. Is built-in illumination worth an extra $40 though? We went nocturnal with our reading to find out. We’ll cut to the chase for anyone already familiar with the Nook Simple Touch: Other than a new gray border, the GlowLight is the only major addition to this e-reader, but we think it’s definitely worthwhile, assuming you like to read in the dark. Unlike the iPad (or Nook Tablet), this does not have a backlit screen. Like many watches, the Game Boy Advance SP, and select other devices throughout the years, the new Simple Touch uses a front light to produce its blue-tinged glow. The light distributes fairly well, though you can definitely tell that it originates from the top of the screen, where there are visible halos. There are a few tiny downsides to having the light. The tablet appears to have ever so slightly less contrast and E Ink consistency than the last Nook, though only geeks like us are likely to notice. However, a new anti-glare screen should help its readability ever so slightly outdoors. The GlowLight edition’s screen also gets a few more refreshes per cycle (6 instead of 4 between black screens). The battery life is about half of the non-lit version, but B&N still claims it can get one month of life if you read it with the GlowLight on for an hour a day. Barnes & Noble wasn’t fortunate enough to create an e-reader brand before the Kindle, but with the Simple Touch, it really did fully mimic all of Amazon’s functionality in a very compact form factor. The new versions continue this trend. The first Nook had the standard 6-inch E-Ink screen that most e-readers seem to possess (it’s great on the eyes and the battery), but also had a small, awkward capacitive touch panel on the bottom. The panel made the Nook awkwardly large, and also hurt its ability to compete with Amazon on price. The Simple Touch models trade almost all buttons and gizmos for a single touch panel. By combining an infrared grid of sensors along the top of the E-Ink screen, Barnes & Noble has created its own E-Ink touchscreen. You don’t technically need to even touch the screen to activate it. As long as some object breaks the grid, it will work. Though the original Simple Touch came out in June 2011, a few months later, Amazon released the Kindle Touch, which also uses an infrared touchscreen. B&N is, once again, in the lead though, as the first to add a front light. We expect Amazon will follow suit soon enough. Like all E-Ink readers, the Simple Touch is great to read outdoors and in sunlight. The Nook Simple Touch is almost as small as its screen, with only two somewhat invisible buttons on each of its sides and a logo (‘n’) along its front, which brings up a menu (Holding it turns the light on or off on the model with the GlowLight). Everything else is in the screen. Holding the Simple Touch is easy. B&N has covered the back in a rubberized material and curved its shape to help with grip. Changing pages can be done with the side buttons, or by tapping on the left or right side of the screen. It’s light enough (half a pound) and small enough that you almost wish it packed a slightly larger screen, but as a competitor to the Kindle, it gets the job done. The interface is mostly what you’d expect, though it’s surprisingly touch friendly. B&N has included gestures like swiping to unlock and navigate menus. There isn’t a huge tutorial, but most of the menus work as you’d expect and the onscreen keyboard is surprisingly responsive. You can now tap on a word itself to highlight it or look up its definition. Due to the slow refresh rate of its E-Ink screen (you trade text clarity for color, backlight, and refresh speed), you can’t really watch moving video on the Simple Touch, but other forms of content are present, like magazines, newspapers, short stories, and books. The menus are divided very cleanly: you can enter your own library or shop for books in one of Barnes & Noble’s stores. Downloading is fast and easy. The Barnes & Noble Nook e-book store is solid and a bit ahead of Amazon’s Kindle store, the Cobo store, and Google’s Play eBook store. Amazon boasts more than 1 million books, but thanks to a partnership with Google the Nook store has more than 2.5 million books (more than a million of which are free). All of the big hits are here, and the back catalog of older and free books is quite impressive. Any books or content you buy will also be available on Android and other devices via the Nook app, which essentially means you have cloud storage for your purchased content. The Nook organizes its shops in a more pleasant way as well. Though Nook offers some e-book lending, Kindle is still ahead in this area thanks to its Amazon Prime program which lets users borrow 5,000 books for free, including many best sellers. Specs are largely irrelevant in an e-reader, but here is what the Nook is packing. It has an 800MHz TI OMAP 3621, 2GB of internal storage, 256MB of RAM, a microSD slot for up to 32GB of additional storage, a 6-inch 600 x 800 pixel E Ink screen, Wi-Fi, and all these are housed in a plastic casing. Foxconn is the Chinese manufacturer of the device. The Nook supports several common file formats, including ePub5, JPG, PDF, PNG, GIF, and BMP. Unfortunately, it cannot open DOC or TXT files. Its support of ePub means that you can potentially transfer books from many other stores onto your Nook. Like all E Ink readers, the Simple Touch gets astounding battery life. On a full charge, you can expect about two months of battery life, if you read it for about an hour a day. It uses so little power that it’s actually almost a waste of time to turn the device off at all, though a power button does exist. Because Amazon defined the e-reader market, it got to set many of the rules for devices like these. Mostly, the Nook has attempted to match Amazon’s features, but it does have a couple advantages, including its screen refresh rate, which is slightly faster than the newer Kindle, as well as its support for ePub. Though the Kindle is very popular, users of it are limited to content purchased from the Amazon store. ePub is an open format that many e-book stores use (like .MP3 is for music). In a very Apple-like move, Amazon does not support open book standards and tries very hard to keep its devices locked down. 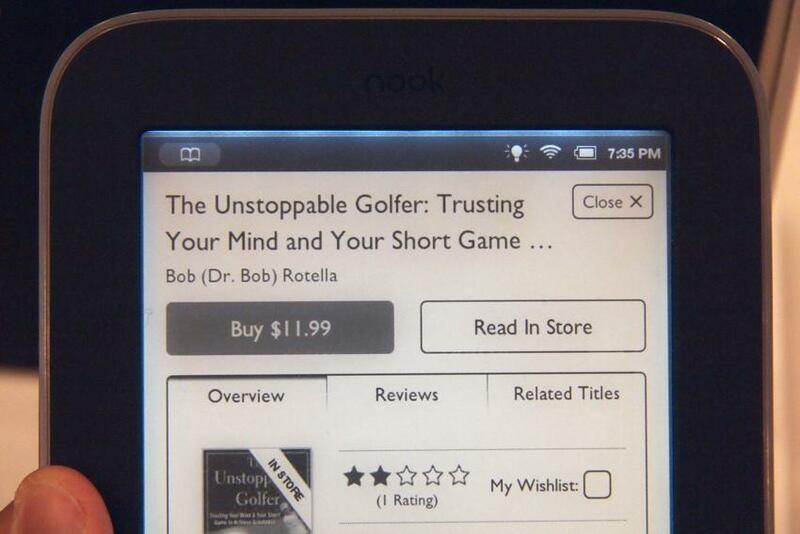 All Nooks are also backed by real Barnes & Noble stores and support staff that you can visit anytime. On the downside, Amazon’s content library is a bit larger, and Kindles also include speakers for audio, which opens the doors for audiobooks through Audible.com, automatic audio reading, and other content. Amazon also offers a Kindle model with 3G support, which makes it possible to download e-books free of charge, without the need for a Wi-Fi connection. The Kindle can also open HTML, TXT, TRF, MOBI, and PRC e-books, which is a plus if you happen upon files of those types. At $140, the Nook Simple Touch with GlowLight is a bit pricy, considering the Nook Simple Touch is essentially the same unit sans a light for only $100. Either way, both are a great alternative to the Kindle and jump ahead of Amazon in a few ways. If you’re someone who might want to sideload ePub books or PDFs from your PC onto your e-reader, the Nook is much easier to use than the Kindle. If you can find a book on the Kindle, chances are it’s on the Nook as well. We like how small the Simple Touch with GlowLight (and without) is as well. The Kindle may beat Nook slightly in a few areas, but when it comes down to it, nobody getting a Nook is going to walk away disappointed because it’s not a Kindle. 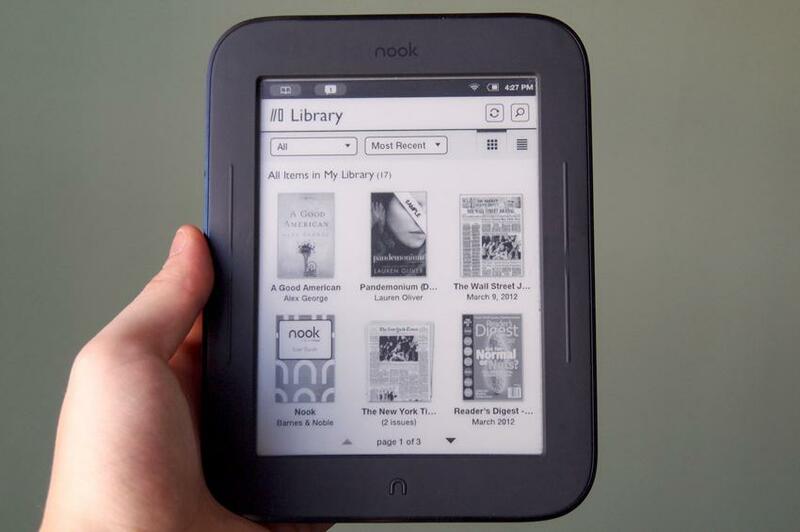 And in many ways, the Nook is superior to Amazon’s market leader. Keep it up, B&N. We can’t wait for the Nook Simple Touch with 3D (kidding).